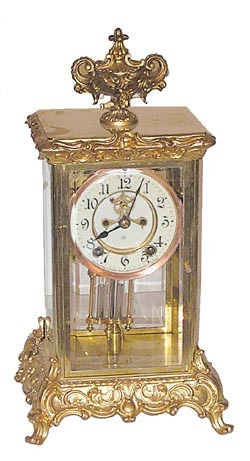 Ansonia Clock Co., crystal regulator, "Crown", ca 1914. The case is practically restored. It was disassembled, metal parts painted gold (very good for gold paint), movement was cleaned and is now running well. They went on to bigger and better jobs leaving 2 ornaments off the top-front of the case. I would think they are now lost. The bezel was put in a cleaning solution, which cleaned off the gilt right down to the copper. The polished brass body of the case is fine, just top and base painted gold. Glasses need to be tightened a tad. Correct 2 jar imitation mercury pendulum, excellent 2 piece porcelain dial with open escapement. 8 day, half hour cathedral gong strike. Ly-Ansonia No.357.